Monday April 27th - Northern Illinois University invites you 2015 BFA Senior Actor Showcase. Its Meisner based classically trained actors will present both contemporary and classical scenes with a mix of monologues and reels. Scenes directed by Kay Martinovich. Private invite only event. 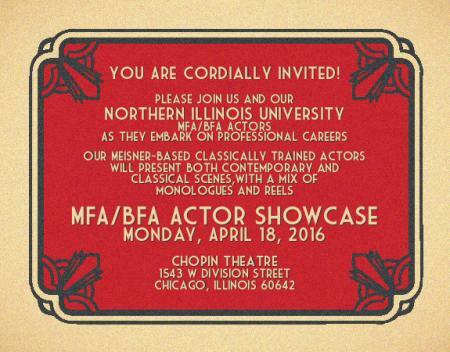 Monday April 18th - Northern Illinois University invites you 2016 MFA/BFA Actor Showcase. Its Meisner based classically trained actors will present both contemporary and classical scenes with a mix of monologues and reels. Scenes directed by Kay Martinovich; coached by Patricia Skarbinski and reels directed by Anthony Perella, Jr.
A Private by invitation only event. Patricia Skarbinski; Anthony Perella, Jr.